Next Week, February 12 to 18, is Random Acts of Kindness Week. And it’s the perfect opportunity to shower some kindness on the people in your life — or maybe even a total stranger. We’ve all heard stories about the person at the drive-thru who bought coffee for the stranger who was next in line. Simple deed, big reward. Everyone could use a little boost from time to time to raise their spirits. Those who need a little extra support – an elderly neighbor, an adult with a disability, a loved one recuperating from surgery – could find even the smallest gesture extremely meaningful. So would their caregivers, who no doubt could use a little extra support themselves. We have some ideas that can inspire you to make a difference, no matter how big or small the act of kindness. Spreading kindness starts with one act – one smile, one coffee for a stranger, one favor for a loved one. Doesn’t the world need more kindness? The Random Acts of Kindness Foundation thinks so. It’s a nonprofit organization, founded in 1995, aimed at creating a kindness movement. It provides free online resources to encourage acts of kindness in homes and communities across the globe. Each year, during the second full week of February, it promotes Random Acts of Kindness Week as an opportunity to unite through kindness. The idea is simply to encourage people to adopt kindness as part of their everyday lifestyle – and leave the world better than they found it. When we engage in acts of kindness, there’s no doubt it makes us feel better. But did you know there’s real science to back up why kindness boosts our overall well-being and helps us cope with the stresses of everyday life? Numerous studies show that both giving and receiving acts of kindness increases the production of several life-improving chemicals, including serotonin and oxytocin. Increased levels of serotonin can make you feel happy and relieve anxiety. 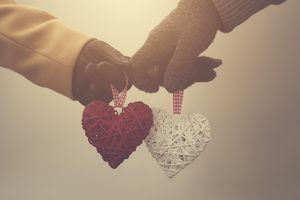 A boost of oxytocin, also known as the “love hormone,” is produced when people bond socially, and it can lower blood pressure and improve heart health. And if that wasn’t enough, perpetually kind people also have 23 percent less cortisol (the “stress hormone”) and age two times slower than the average population. So spreading kindness is not only good for the person receiving the kind gesture, it’s good for you, too! Offer to drive them to a doctor’s appointment. Bring them a meal for lunch or dinner. Ask for a grocery list and do the shopping for them. Stop in for a visit. Play cards or work on a puzzle. Or just sit and chat. Offer to take their pet for a walk. Make it a habit to bring in their mail and newspaper. If you live in a snowy region of the country, shovel their front walk or driveway. Short on time? Pick up the phone and say hello! Sometimes a friendly voice is all that’s needed. Try asking what’s on their to-do list and offer to help. Run a few errands. Make a run to the pharmacy or pick up dry cleaning. Help out with house cleaning. Dust and run the vacuum, or hire someone for the job. Tackle their yard work. Mowing, weeding, trimming. Plan a “respite” evening away from caregiving. Treat them to dinner out or a movie. Bring a meal to give them a night off from cooking. Or even just drop by with a batch of cookies! Take over some of the caregiving duties. Sit with their loved one for an hour so they can have a few moments to themselves. Gather caregiving information and resources. Put them in touch with people who can help. Write a personal letter of thanks. Put pen to paper and tell them how much you appreciate them. Need more ideas? The Random Acts of Kindness Foundation’s Kindness Ideas have you covered. One way to help those in need of care and their caregivers is to connect them with a resource that can provide support. At FirstLight, we’re caregivers who are committed to creating real, personal connections through kindness and compassion. Caregiving is more than what we do. It’s our calling. By putting people first, we help family caregivers and their loved ones achieve the quality of life they deserve. Isn’t that what kindness is all about? Find a location today to learn how we can help. Great reminders in the article. We look for opportunities to serve our elderly community in Boerne by helping out with free minor repairs and painting when we can. That’s wonderful! Home maintenance can be one of the biggest challenges faced by older adults who continue to live independently in their homes. We truly appreciate what you do!